The building block of all thunderstorms is the thunderstorm cell. The thunderstorm cell has a distinct life-cycle that lasts about 30 minutes. 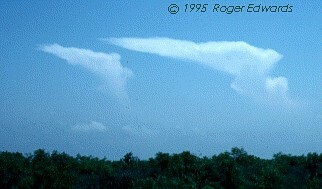 A cumulus cloud begins to grow vertically, perhaps to a height of 20,000 feet (6 km). Air within the cloud is dominated by updraft with some turbulent eddies around the edges. 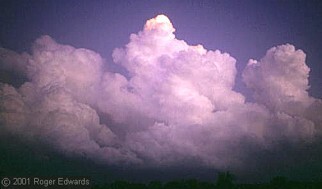 An example of towering cumulus. The storm has considerable depth, often reaching 40,000 to 60,000 feet (12 to 18 km). Strong updrafts and downdrafts coexist. This is the most dangerous stage when tornadoes, large hail, damaging winds, and flash flooding may occur. 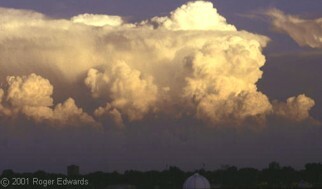 An example of mature Cumulonimbus. The downdraft cuts off the updraft. The storm no longer has a supply of warm moist air to maintain itself and therefore it dissipates. Light rain and weak outflow winds may remain for a while during this stage, before leaving behind just a remnant anvil top. An example of the dissipating stage.